To be admitted to one of the free-access degree courses of the Università degli Studi di Torino, you must have an adequate preparation. The Test for the Assessment of Minimum Requirements (TARM) will assess your preparation. In the dedicated page (pagina dedicata) of the University website you can find information about the Test for the Assessment of Minimum Requirements, which is the same for all free-access courses starting from the 2018/19 academic year. The information is constantly updated, therefore check the page frequently. Enrolment in all free-access courses requires you to take the TARM. Starting from the 2018-2019 academic year, the TARM will be the only test required to all aspiring first-year students of a free-access Bachelor or Full-cycle degree programme, that is, all programmes which don’t require an entrance test or a limited number of students. The TARM will be taken only once in the University, even if you fail it. Those who already took it in May 2018 and failed, must take it again starting from September 2018. [Applications & Enrolment. 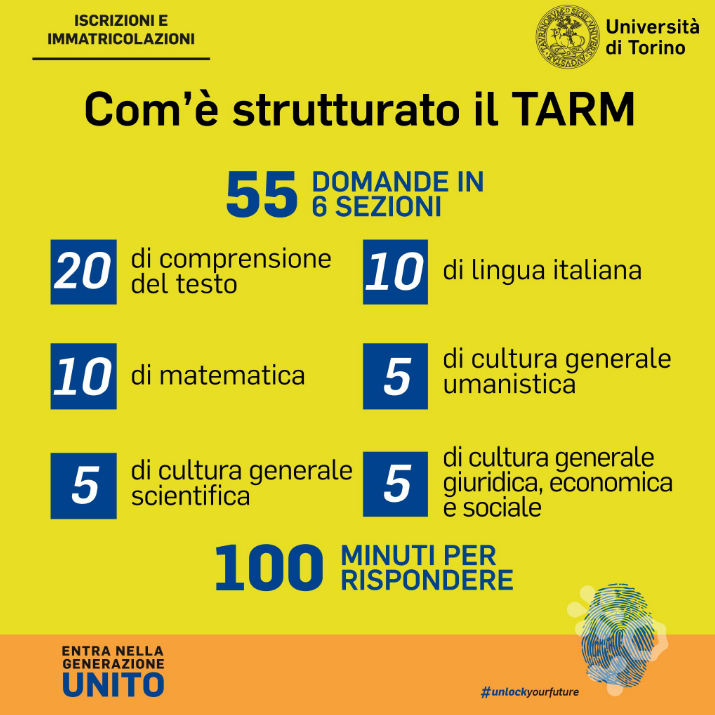 How is TARM structured: 55 questions in 6 sections. 20 – reading comprehension; 10 – Italian language; 10 – Maths; 5 – humanities general knowledge; 5 – scientific general knowledge; 5 – law, economics and social general knowledge. 100 minutes to answer. Be a part of the UNITO generation]. The test is aimed to assess different skills. It is made up of six sections and 55 multiple-choice questions (as shown above) to be answered in maximum 100 minutes. The minimum threshold to pass is 30/55. If you pass the test (marking at least 30 correct answers) you will be able to proceed with the enrolment (immatricolazione). After the enrolment, you will be able to fill out the study programme starting from October in order to take the exams in the first available session. If you fail the test (scoring less than 30), you will be able to proceed with the enrolment (immatricolazione), starting from the third working day after taking the test, but you will be given OFAs (Obblighi Formativi Aggiuntivi – Additional Formative Obligations) which are a part of the Passport.U programme. Passport.U is an online programme, aimed to help students to know soft skills, to acknowledge their own soft skills and develop them. At the end of the self-assessment, you may receive an individual feedback, from which the programme will propose self reflection activities, lectures and lessons, online exercises, videos and more. The OFAs are dropped when the programme of personal soft-skill enhancement is completed. Then you can fill out the study program, starting from October. If you don’t attend the course, you will not be able to fill out the study program and take exams. For those who scored between 30 and 40, the online programme Passport.U is still advised. On the Orient@mente platform there is a dedicated area for the facsimile of the test, in order to have a better preparation. You can apply for the test taking place on July 17, 2018. Fill out the application and choose when (date and time) to take the exam. If you are a disabled student, during the application you will be able to request particular assistance tools for the test, and/or extra time (50% more). In order to have your requests granted, you must upload pdf medical documents certifying your disability (with no omissions). For specific information, visit the dedicated page (pagina dedicata). 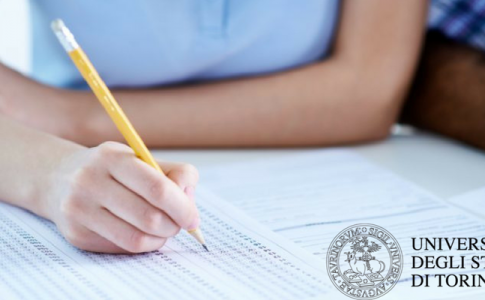 If you are a student with SLD (Specific Learning Disorders), during the application you will be able to ask for extra time in the test (30% more). In order to have your request granted, you must upload a pdf medical document certifying the SLD. For specific information, visit the dedicated page (pagina dedicata). Once you have confirmed the date you chose to take the test, you will not be able to change it anymore. Single session application deadlines: applications for a specific session end 5 working days prior to the day of the test, or when the maximum number of people in the room is reached. When the maximum number and/or the 5-day deadline is/are reached, the session won’t be shown anymore. For the disabled or students with SLD, applications end 10 working days prior to the day of the test.